Preheat oven to 350°F (175°C). Heat a large skillet over medium-high heat. Evenly season pork tenderloin with salt and ground black pepper. Sear all sides of the tenderloin, about 1 to 2 minutes per side, until browned. Place pork tenderloin in a roasting pan and bake in the oven until the internal temperature on a thermometer reads between 145°F (162.7°C) for medium rare and 160°F (71.1°C) for medium, about 15 to 18 minutes Remove pork from the oven and cool to room temperature. Wrap tightly and refrigerate overnight. In a small bowl, whisk together lemon juice, "The Chee" sauce (or kimchi base), and olive oil. Toss 1/4 cup of lemon-chee dressing with arugula and nectarines. Season with salt. Mix remaining lemon-chee dressing with mayonnaise and set aside. Remove pork from refrigerator and cut 12 very thin slices on a slight diagonal. Fill a small bowl with room temperature water. Working with one spring roll wrapper at a time, soak wrapper in bowl of water until softened. Lay wrapper flat onto a clean work surface. Lay 2 leaves of radicchio Treviso on top of wrapper, then some mint and two pieces of pork tenderloin. 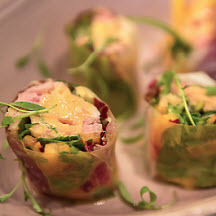 Top with arugula salad and roll up the spring roll wrapper tightly and slice into 6 pieces. Repeat with remaining spring roll wrappers. Place spring roll pieces cut side down on a serving platter, and drizzle with lemon-chee mayo. *You can find kimchi base or an alternative Asian hot sauce (i.e. Sriracha) in the ethnic or Asian section of most major supermarkets, or in any Asian specialty markets. Recipe and photograph courtesy of the National Pork Board.